Last Thursday-Friday, we took a quick trip to Cincinnati, OH. I've driven through the city many times (my brother used to live in KY) but never actually visited. We wanted to see the Terracotta Warriors Exhibit at the Cincinnati Museum of Art, so we decided to stay overnight & explore. There were several restaurants that sounded good, but Sotto really appealed to me - pasta! 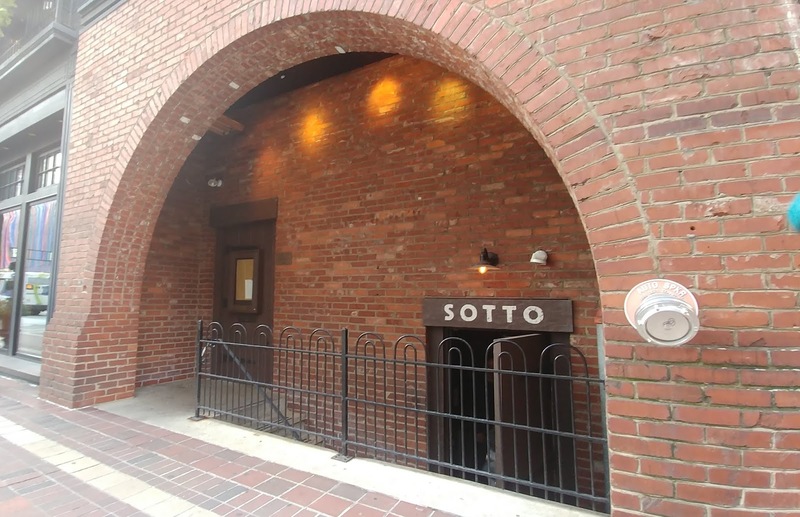 Sotto is quite popular and even a month in advance, it was tough to get a reservation. 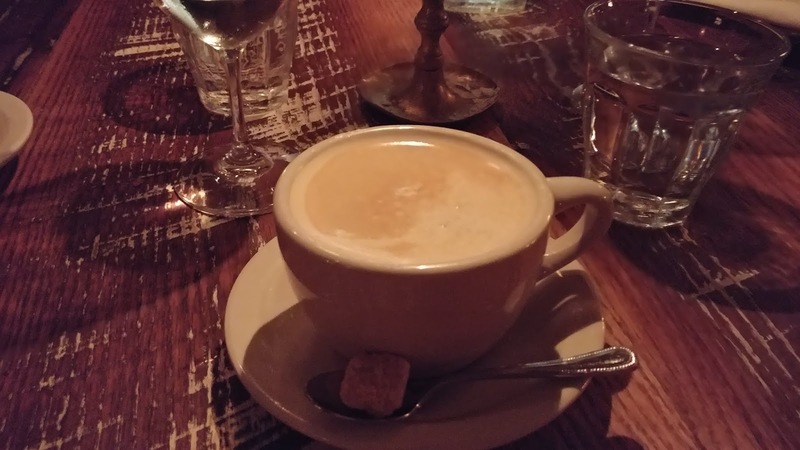 On a Thursday evening, I had a choice between 5 pm and 9 pm. I chose 5 pm. 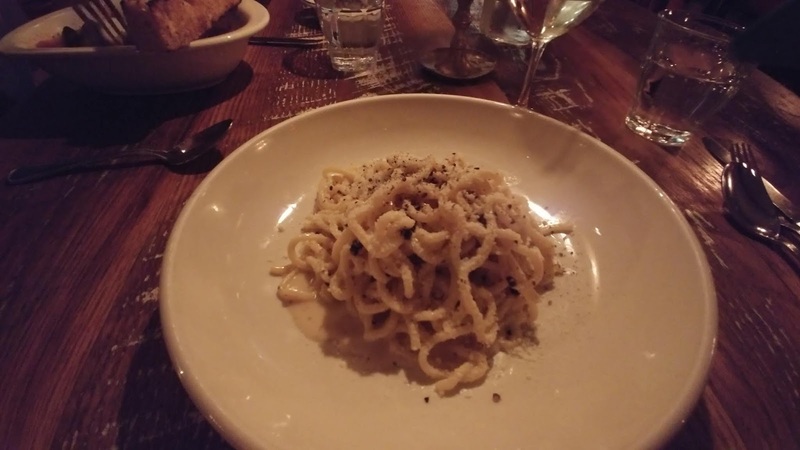 As you can see in the above photo, it's down a flight of stairs, but fortunately, a restaurant next door (Boca) has an elevator that goes down to Sotto. 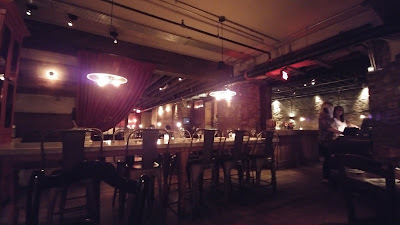 It was bright & sunny outside at 5 pm, but then you step off the elevator in a dimly lit restaurant. It felt like entering a secret place. 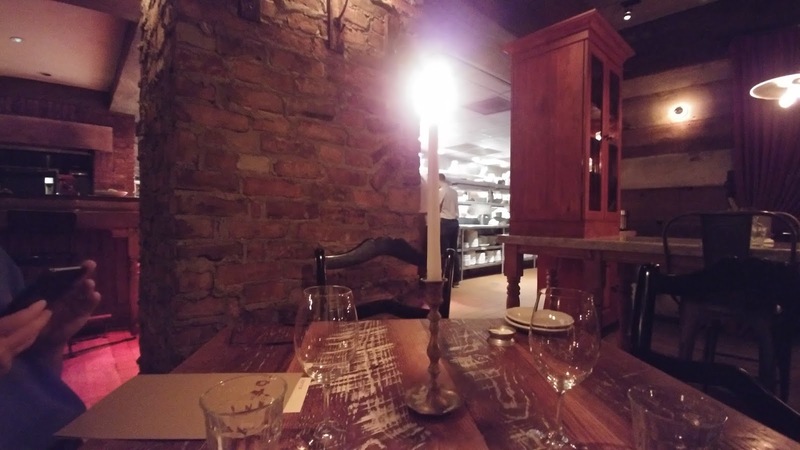 There was a lot of exposed brick and a tall taper candle on each table, the flame flickering as people whizzed by bearing plates of delicious smelling food. It was cozy. It was a little difficult for my old eyeballs to read the menu in the dim light and I felt like using the flashlight on my cell phone would be akin to blasting an interrogation light in someone's face, so I tried to angle my menu into the candlelight. The wine menu is full of Italian wines with which I am not familiar. 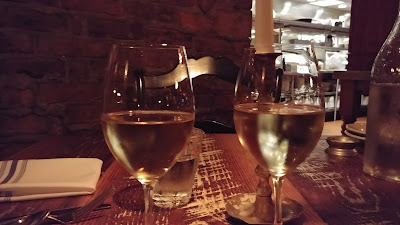 In the end, after consulting with our server, SP opted for a glass of Fiano and I chose Gavi. We liked both. 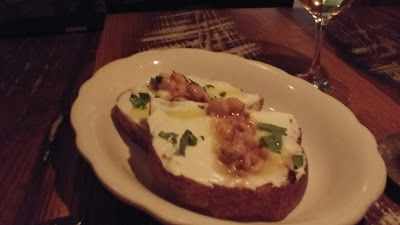 Goat Cheese & Hazelnut Honey Bruschetta. Really good. Creamy goat cheese. Honey drizzle. Crunchy nuts. I used a knife and fork because the honey made it a little too sticky to pick up with my hands. 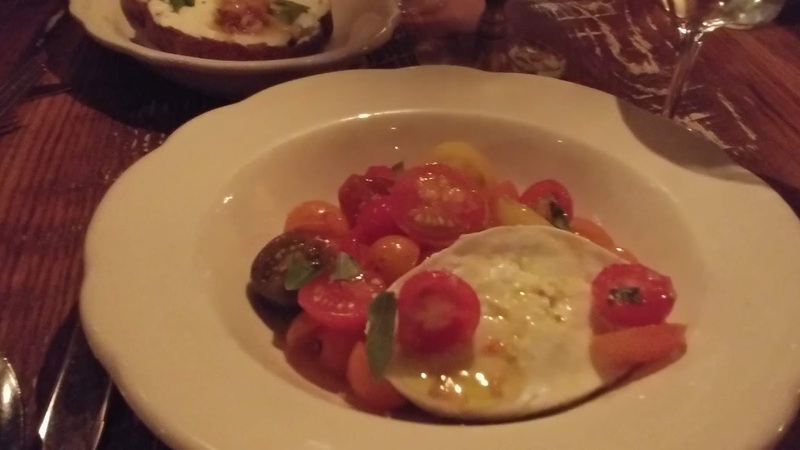 Mozzarella di Bufala with tomatoes, basil, olive oil, sea salt. It's summer, tomato season, and I can never pass on this dish even though we make it at home. It always tastes better when the pros make it! Really good. 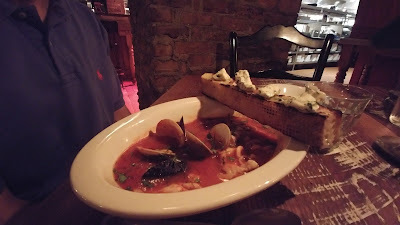 For his entree, SP chose Brodetto di Pesce (shellfish, cod, san marzano, fennel). He ate it all while making "yummy" sounds. 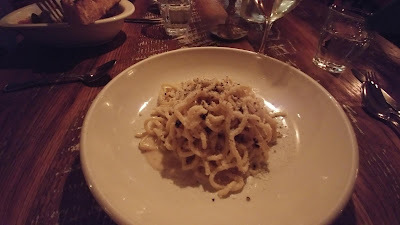 chitarra, black pepper). So simple but so darn good. We each had an after dinner Cappuccino. 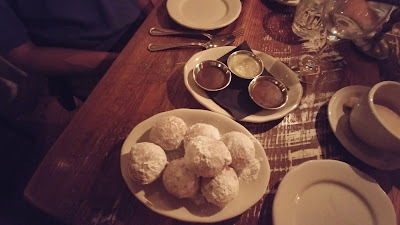 There was never any doubt that we would have the Ricotta Doughnuts (with three sauces) for dessert. Sure, tiramisu and a chocolate budino were on the menu, but doughnuts always win. The sauces were chocolate, pistachio, and caramel. We both liked the caramel best, which surprised me because I expected to like chocolate best and SP expected to like pistachio best. Excellent doughnuts. Our server was great. She helped us pick our wines, she checked on garlic for me. Food was yummy. If/when we are in/near Cincinnati again, we'd definitely try to have a meal at Sotto.